About the middle of 2001, I decided Sharka, my NA Miata, needed a starter button. I'd seen several installs written up online, but they all used regular old big red buttons. 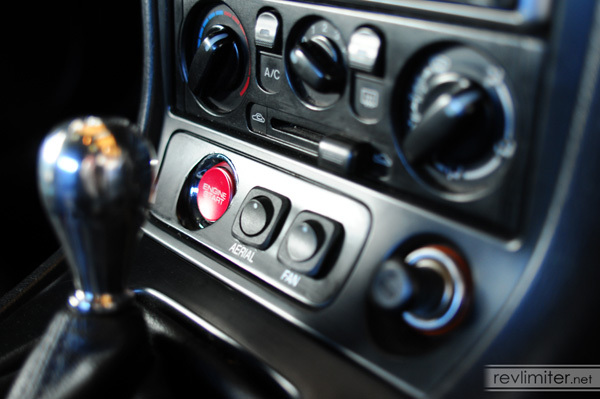 That didn't really appeal to me, till I saw the S2000 start button. It was big, red, came with a chrome bezel, and best of all, was cheap online. I wrote up a set of installation instructions. 10 years later, it is still one of the top 3 most popular pages on my website. My NB languished without a start button for many years. I finally decided I deserved to start both of my Roadsters with a button. So out came my dremel and camera. This document is the result. One Genuine Honda S2000 Starter Button - HandA-accessories.com ref number 609. I'd recommend HandA-accessories.com for as a source for the button due to their extremely low price. One SPDT relay at 30amps/12 volts - Parts Express part number 330-070. That's a Single Pole Double Throw relay. You can find one here, as my #1 source of questions is "where do I get the relay?" I'd suggest ordering two (one spare). One 5-pin relay socket - Parts Express part number 330-075. Like the relay, this is also available here. One 3.5in internal computer power cable - Cables To Go part number 03165. You're basically looking for the type of power connector that your computer's 3.5" floppy drive (the old A: drive) uses. You can find a Y-adapter here. Just cut off one of the small connectors. ~Five feet of 12 gauge wire, and about the same amount of 18 gauge wire in your choice of colors. One large 12 gauge ring terminal to ground the relay to your steering column. ~Six male and six female 12 gauge insulated bullet-style crimp connectors. ~Three 22-26 gauge vampire taps to tap your handbrake and cigar lighter. ~Six insulated 18 gauge spade style crimp connectors for starter button wire connections. The Relay: The #1 source of questions is this relay. The first thing you should know, is that an SPST relay (single pole, single throw) won't work. 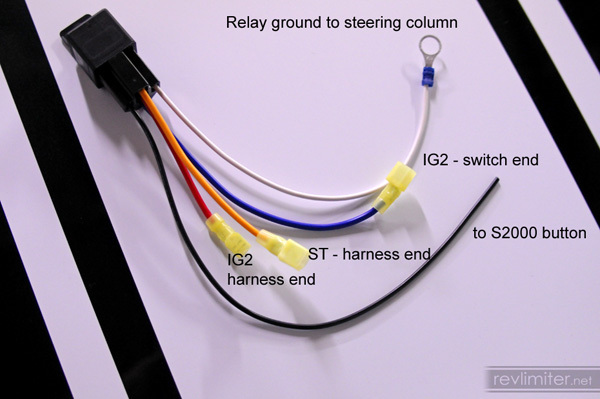 The use of a SPST relay will result in your wipers, heater, and various other things on the IG2 circuit not working. "But wait, my 5 prong relay doesn't work either!" This is one I've heard many times. They sell SPST relays with 4 prongs and 5 prongs, usually with two 87 outputs. This will not work. You need an SPDT relay, with 5 prongs (that's an 87 and an 87a). You can find this relay at Parts Express, as I linked above, or very rarely at local auto parts stores such as Autozone. Keep in mind, that you're very likely to find the 5 pole SPST relay at these local shops. 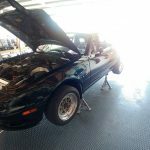 The Car: These instructions are specific to the NB Mazda Miata (98-05). 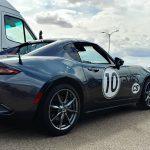 For NA instructions (90-97 Mazda Miata) go here. 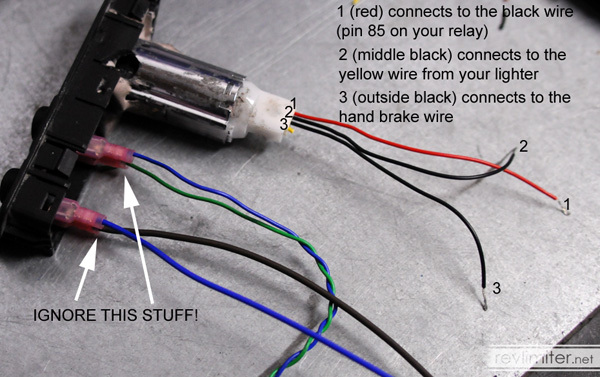 I have no idea how to wire up your (insert Make here) (insert Model here) ignition system. I'd recommend a Haynes manual, as they have excellent wiring diagrams in the back. Good luck! How it works: Once you've got this hooked up as I outline in the instructions, you'll only be able to start your car with the S2000 starter button. Turning the key to the "start" position does nothing. 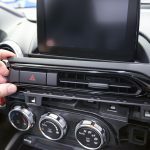 "How do I hook it up to allow both to start my car?" Honestly, I don't know. I've never tried to redo the diagrams to allow both the key and the button to start the car. "Is it easier to steal the car now?" No. 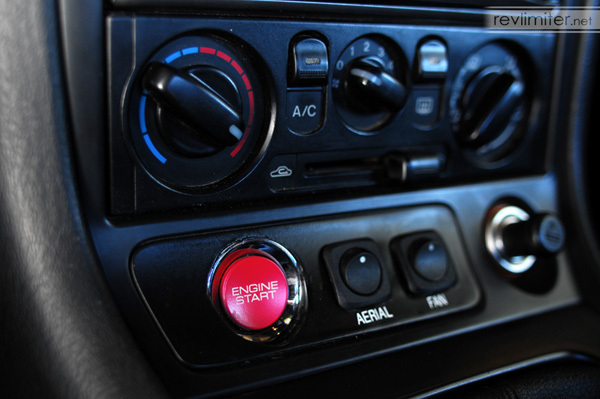 The S2000 button just replaces the "Start" position of your key switch. You still need the key to start the car. 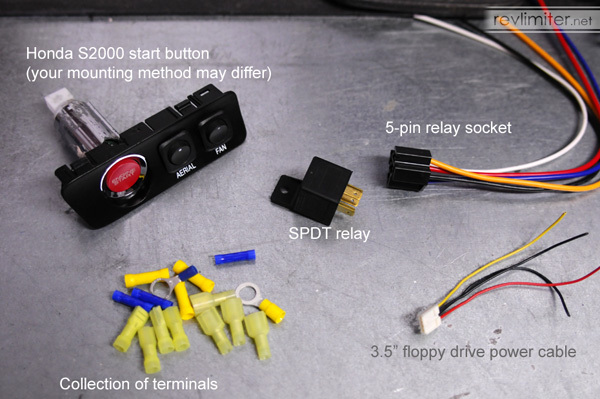 The Master Diagram: By popular demand, I have created a master diagram of the start button, relay, relay harness, and the factory wiring. This will not make much sense to you at the beginning of the project, but if you keep referring back to it, most of your questions should be answered. The master diagram: PRINT THIS! Disconnect the negative cable from your battery. Safety first here. If you're too lazy to disconnect your battery, at least do all your work with no key in the ignition. Step 1: Figure out where to mount your start button. There's so many places and ways to mount your button, I'm not even going to try to get into it. I chose to modify a spare airbag control and relocate my airbag switch to the glovebox. But that's just me. Good luck on your mounting! Just go slow and plan every step. Step 2: Wire the relay. Study the diagram for a moment. It shows insulated 12 gauge (yellow) bullet connectors, and I'd certainly suggest using something like that. 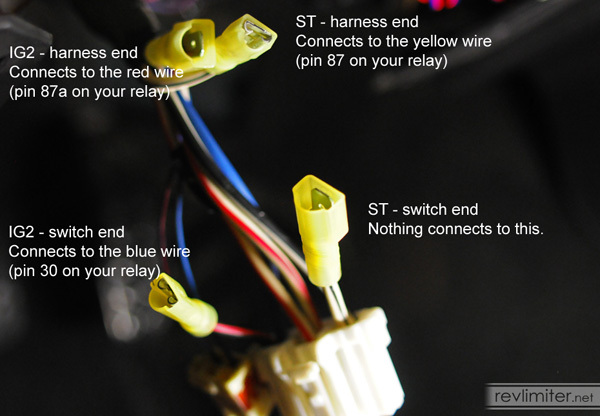 This diagram also shows both the colors of the factory wiring harness, and the colors on the back of your relay harness. 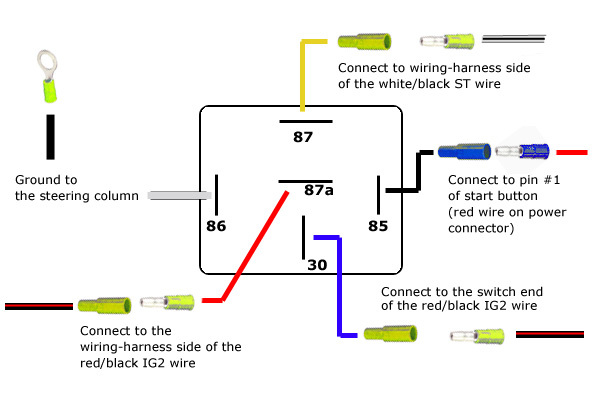 Refer to the above master diagram for a visual reference to all associated wiring colors not included on this diagram. I used 12 gauge wire for all of my relay-to-factory connections and 18 gauge wire (note the blue connectors) for all my start button connections. Finally, notice that there's a ring terminal that says "Ground to steering column." There's two large bolts on the steering column, holding it in place, that are excellent grounds. You can either use a large ring terminal, or a small fork terminal wedged under one of these large bolts. The relay socket makes life easy. Wiring your relay is incredibly easy if you use on of the 5 pin relay sockets that Parts Express sells and I'd highly suggest using one. If you are using it, the following list will be useful. 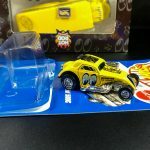 Pin 87 - yellow - connects to the blue/black ST wire. Pin 85 - black - connects to your red #1 wire on your start button. Pin 30 - blue - connects to the red/black IG2 wire on the key switch. 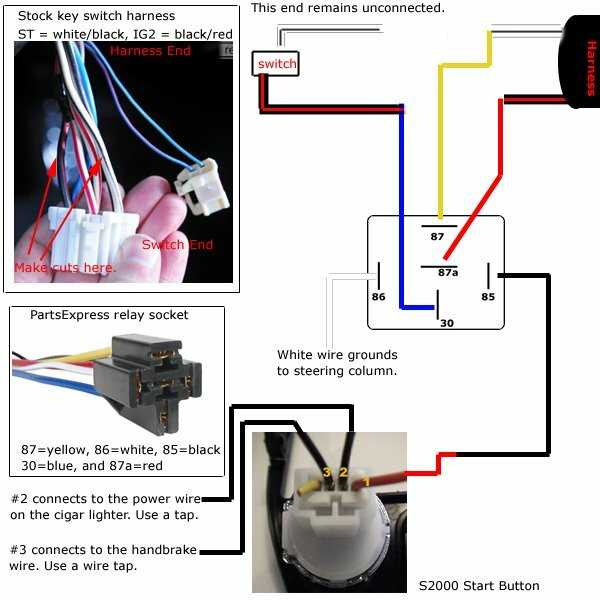 Pin 86 - white - connects to your steering column ground. When you're ready to wire your relay, locate your bullet/spade terminals and crimp them onto each wire as shown in the above diagram. 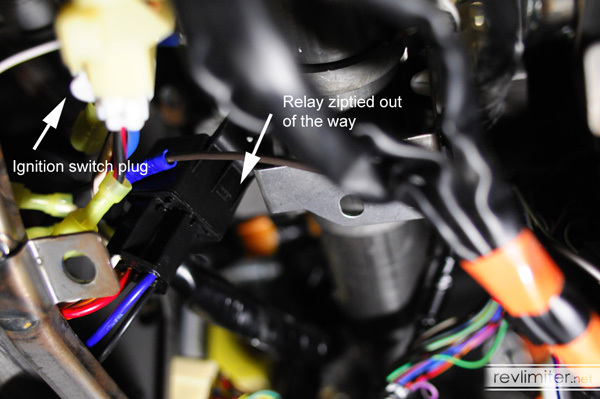 The photo helps you see just how short some of the wires on the relay socket need to be cut. Finally, connect pin 85 (black) on the relay socket to pin #1 (red) on your starter button's output wire. Step 3: Modify the factory wiring harness. Next, you get to slice into your factory wiring. You only cut two wires, but it still requires some planning. If not already done, remove the knee guard from below the steering column. The starter switch wiring harness. This little guy lives to the left side of the steering column (that's the opposite side of the key switch) and has two small plugs connecting it. Unplug both. The 6 prong harness with the beefy wires is the one you'll be modifying. The small harness is for the door buzzer. The wires you want are on either end of the top side of this plug. 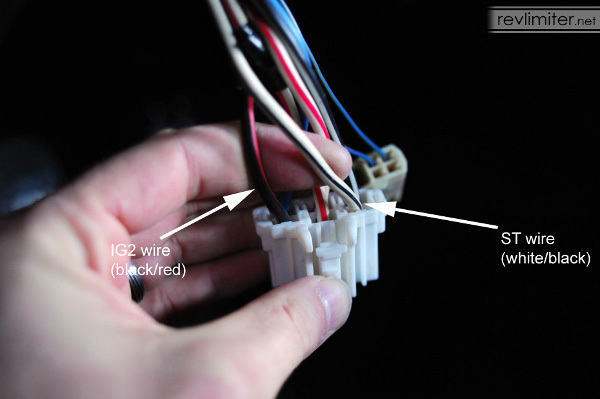 The IG2 wire is black with a red stripe (on the left). The ST wire is white with a black stripe. Do not cut right at the key switch, rather cut an inch or more away. 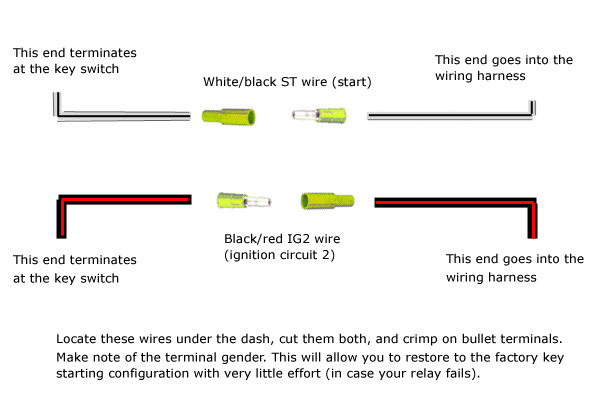 Make your cut and crimp on your insulated terminals as shown in the photo above. Why are you doing this? When (not if) your relay fails, you want to be able to quickly reconnect everything in the factory configuration. You'll just unplug the factory wires from your relay socket and plug them back into each other. Relays fail after x number of uses. In 12 years, I've had replaced the start button relay twice. Once you've got the wires sliced and the correct crimps installed, just connect the relay and socket combo. Three wires will get connected and the short white/black one nearest the switch will just dangle. Then bolt the ground connection to the steering column. At this point, you can either let the relay dangle or you can tie it up and out of the way with some zipties. And don't forget to plug that starter switch plug back in! Step 4: Wire the start button. You'll need the internal PC power connector you see in the above photo. This is the one that connects to a small 3.5 inch floppy drive that computers used to have. It's a four prong connector, and the S2000 button is a 5 prong, but since only 3 of those prongs actually do anything, we're ok. Just plug the power connector onto the button and clip off the fourth wire. You'll need to extend these wires to meet their respective source wires, but we'll do that in a later step. As you can see from the diagram, the prongs are labeled 1, 2, and 3, starting from the right. The lower picture is my original hacked-up starter button housing. It serves only to show which prongs are which. Don't let it confuse you. You'll be connecting #1 to pin 85 on your relay (the black wire). #2 and #3 provide power and ground for the little light inside the button. We'll get power from the lighter and ground from the e-brake. Why? We use the handbrake ground so that the little "ENGINE START" light will only be lit when the hand brake is in the up position. Yet another start button connection diagram. Connect your start button to the relay now. In case the many many diagrams above didn't tell you enough times, run the black wire from the relay (pin 85) to the red wire on the start button (pin 1). I needed a short jumper wire to bridge the gap. About a foot of 22 gauge wire did the trick. This wire is just activating the relay, so there's no need for beefy 12 gauge. Connect to the lighter power. 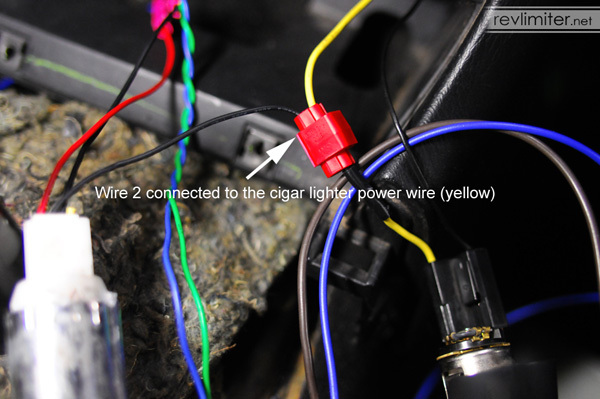 Now, go to the bottom of your center cluster and dig around for the cigar lighter wiring harness. It has two wires, a yellow and a black. The non-black is your power wire. I'd recommend verifying which is the power wire with your multimeter. Run a lead from your start button wire to this power wire and tap into it. Since my button and the lighter were so close, I was able to get away with using the small wire on the A-drive connector. Connect the hand brake wire. 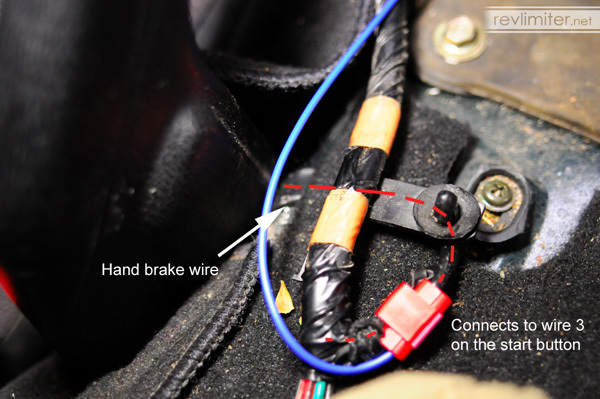 Find the single wire coming out of your hand brake (emergency brake). There's only one. This is the wire that tells the dash light to turn on or not. It's just a ground wire. Connect it to wire #3 on your S2000 start button. I had to add a short jumper wire for this connection as well. About a foot of 22 gauge wire (in blue this time). And a vampire tap. I usually hate vampire taps, but for these small gauge connections, they usually work quite well. That's it. 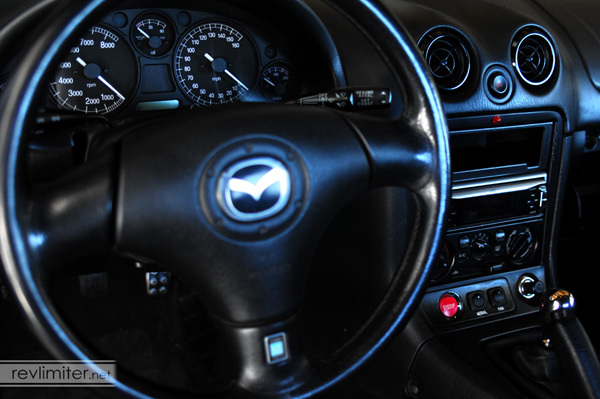 Aside from cleaning up your car and making everything pretty, your start button is now installed. Plug your battery back in and give it a press. 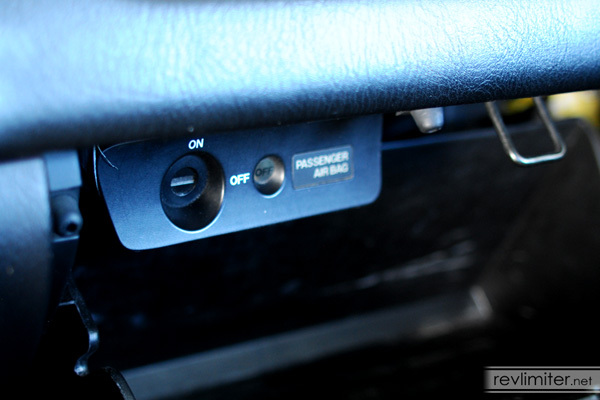 Step 5 (optional): Relocate your airbag/lighter/power mirror switch. Much like step 1, you're pretty much on your own here. The lighter can be relocated into your glove box pretty easily. A trip to your friendly local auto parts store should get you a weather-proof lighter housing that you can mount anywhere. Just connect it to the factory lighter wires and you're set. As for the airbag control, it's very easy to move around. The wiring harness is quite long. It's easy to free some of it from the factory electrical tape and stretch it out somewhere. I put mine in the glove box. My control is secured to the HVAC duct work (it runs along the "roof" of the glove box) with some double sided tape. Don't laugh, I used 5-lb-per-inch tape. VERY strong stuff. And I lined the entire top side of that little control box. It's bonded to the HVAC duct quite well. Maybe permanently! If you choose to put your button in place of the power mirror switch, I'm not sure what to recommend. 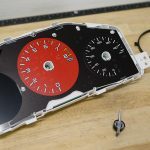 Perhaps cutting a square hole just below the OEM mirror switch location and snapping it in there? I considered doing this at first, but the airbag panel seemed much more inviting. And that's it! Have fun starting your Roadster!